Week 5 Results & Week 6 Games Announced! Okay, last night we had a lower attendance rate than usual but that was expected for the post holiday date, next week I’m sure we will see a few more faces back at MSA! For week 5 Tom Vandenburg and Brian Bauer come away as the MVPs both posting 17.5 points and winning their respective groups! They were closely trailed by Keith Alyea and Darcy Thomas who were nipping at their heels with 17 points each. Tom was the winner in Group 1, Darcy in Group 2, and Brian in Group 3! As far as overall standings go Matt and Keith are at the top with Matt edging Keith out by just a 1/2 point right now! 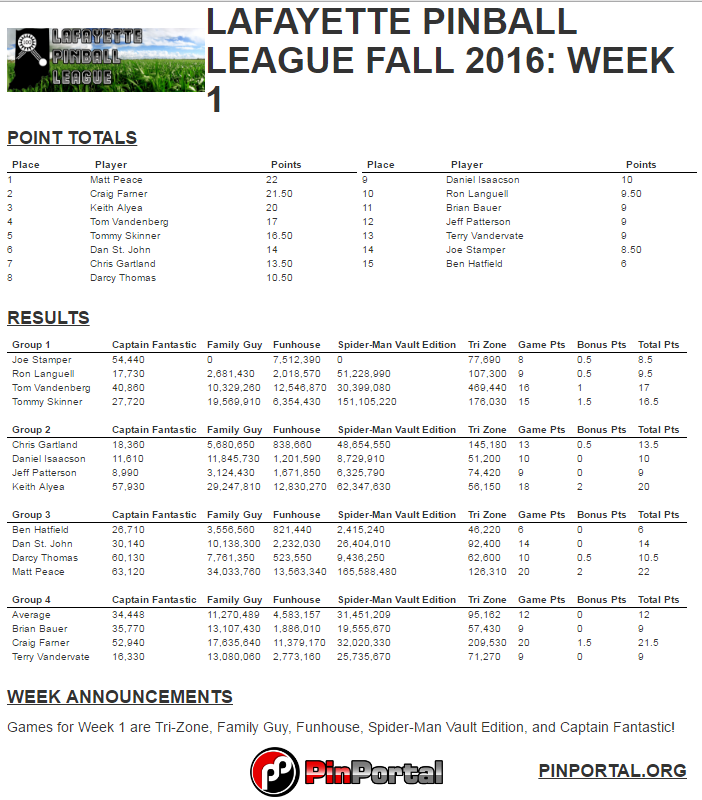 Here are the full week 5 results and overall standings for Fall Season! Games for week 6 are Avatar LE, Eight Ball Deluxe, Star Wars Episode 1, Transformers LE, and Spanish Eyes! Since Eight Ball Deluxe and Transformers LE are featured in the Selfie League for September we will go ahead and play extra balls on those two games! See everyone next week! Also remember next Saturday and Sunday, September 17th-18th is Main Street Mayhem! If you haven’t signed up to play I strongly encourage you to as it will be a very fun two days of pinball. If you really don’t want to play, but still want to check it out I am sure we could use some volunteers to help during the tournament to help report stuck balls, game malfunctions, and other useful contributions. Let me know if you are interested in volunteering, or if you need help getting registered for the tournament! This entry was posted in Announcements, Game Lists, Main Street Mayhem!, Monthly Tournament, News, Results, Super-Selfie League by tsskinne. Bookmark the permalink.